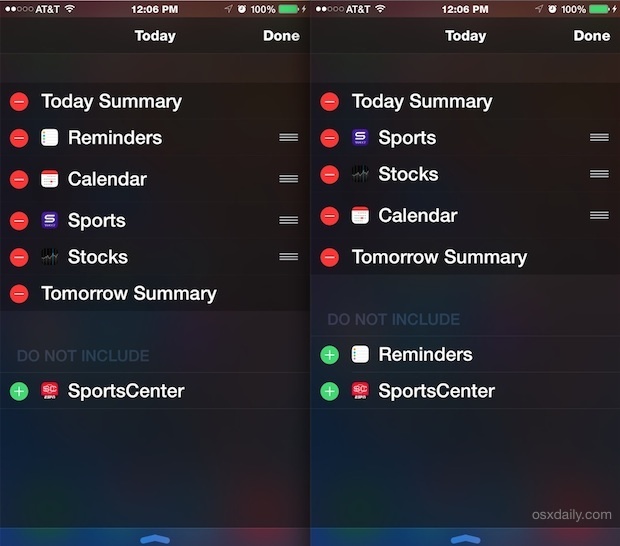 Notification Center on the iPhone and iPad has long included items like Stocks, Reminders, Calendar, a Today summary, and a Tomorrow summary, and now new versions of iOS allow for third party widgets to be added as well. But since not every widget and notification panel applies to everyone, you may want to adjust what appears in your Notifications panel and remove what you don’t use. Perhaps you just want to rearrange the items, so that Sports scores appear above Stocks or so that your Calendar is on top of everything else. 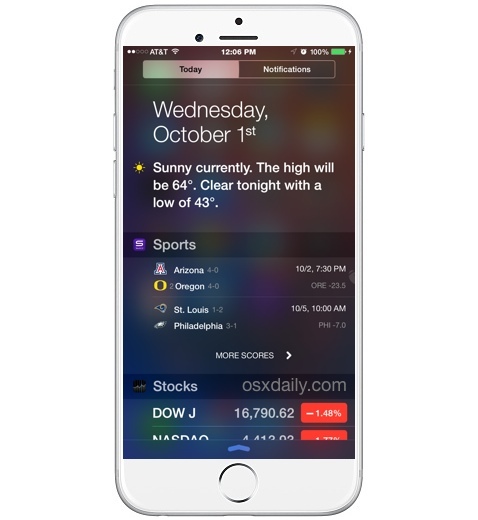 This level of customization is possible in iOS 8 and newer, and it’s really easy to do. For the walkthrough here we’ll use mostly default widgets and apps since they appear on everyones iPhones, but two other apps with widgets are also shown for demonstration purposes; Yahoo Sportacular and ESPN SportsCenter, both of which can be used to display game schedules and scores. Changing the position of things is great, but for some users they may want to hide items from the Notification Center that they don’t have an interest in seeing or using. That’s just as easy. Any adjustments made to Notifications Center here will be visible when accessed from either the lock screen or elsewhere in iOS. The ability to customize Notifications like this is much appreciated and a great little addition to iOS 8, and the Widgets feature is also really handy too. It’s likely that more and more apps will utilize widgets, so as you download more apps on your iPhone and iPad don’t be surprised if the Notifications screen gets a little cluttered and you find yourself heading back into the Edit screen to add and remove things as needed. I get a widget called Traffic Conditions that shows up when I add the Yahoo Weather Widget (which does not find my local weather by the way) Where does this Traffic Conditions come from? It goes away when I hide The Weather widget, but Im sure it does not come from it. Hi, the traffic conditions widget is something that was put there by Apple to give you an indication about when you need to leave for your next calendar appointment. It’s not related to yahoo weather. Oh, if you want to change the location that yahoo weather uses, then log into the app and do it from there. You have to set the location from within the app itself before you get a customised reading. George Rubin with the Naples Mac Users Group in Naples, Florida. Would really like if possible to have someone from your organization remotely talk at one of our weekly meetings. We are probably the largest Mac Users Group in the USA with over 500 members and the most active also. The traffic conditions widget doesn’t seem to work despite having all of the Sytem Services turned on under Location Services. We have 4 iphones in our family and traffic conditions only works on one but they all have the same settings turned on.